The current South Australian Government could learn some lessons from long-serving Premier Thomas Playford who took bold action to wrest control of the state’s electricity supply from a profit-driven monopoly, writes Nigel Carney. When Thomas Playford became Premier in 1938, South Australia, still riding the sheep’s back, was in woeful economic condition. On the brink of World War Two, energy supplies were threatened. The Adelaide Electric Supply Company (AESC), content with its black coal supply from Newcastle NSW and monopoly profits, was at odds with Playford’s radical plan to make good the abundant brown coal supplies in the north of the state. In a chilling parallel to the current foreign stranglehold of profitable foreign energy interests, both the public and government were being held at knifepoint by shareholders of a 50-year monopoly. The Playford solution was bold and radical and remains a template for public asset management that is of critical relevance today, as South Australia reels from the negative impacts of perhaps the most contentious and foolish political decision in the state’s history. Despite staunch public opposition in the late ’90s, the Olsen Government – incapable of managing the fallout from the State Bank collapse – remarkably vandalized the legacy of the Playford era, carving up the Electricity Trust of South Australia (ETSA) and serving it cheaply to an eager private energy market most pleased to profit from the mismanagement of the state. Economist John Quiggin provided a clear warning that the $3.5 billion sale would damage the state and, in 2014, stood by his estimate that close to $2 billion had been lost via the fire sale. As occurred in the Playford era, super profits have become a deterrent to viable industry and the standard of living spirals downward simultaneously. Despite public opposition, the generation and distribution of the SA electricity utility were sold, Quiggin estimates, approximately $4 billion below value, and the economic decline of the state post this 1999 event has become a sad and broken bookend to the Playford achievement and legacy. The company’s website boasts “SA Power Networks has a long and rich history as a South Australian icon”. While the former part of this statement may be true, the latter part is clearly false as the company is neither South Australian or regarded as an icon as regular news headlines of today testify. Current owner of the generation assets, Alinta, is not so quietly leaving the scene of the profit play and was last year looking to sell the fattened cow to the Chinese for estimates of between three and four billion dollars. In a near perfect textbook study of why utilities need to be maintained publicly, unforeseen externalities gather on the horizon like dark clouds (literally, in the case of fly ash) as the mop-up unit Flinders Power grapples with its mine and power station exit plan. Playford, the longest serving premier in Commonwealth history (28 years) fought tooth and nail for seven years to stabilise an insolvent state and, in so doing, achieved his goal of creating secondary industries leveraged from the development of the Leigh Creek Coal Fields, the Morgan to Whyalla water pipeline, and the diplomatic invitation of BHP to establish the Whyalla Steelworks using the public housing trust as a carrot to attract the requisite workforce for his grand vision and plan. So history has repeated and any sane politician would hopefully borrow from the state’s experience of greatness and implement a rescue plan. 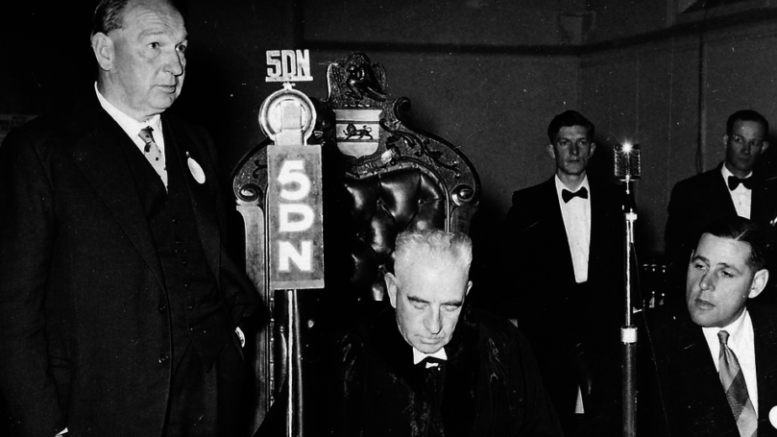 In all respects an amicable and diplomatic breed of politician, Playford during the war years realised he was facing a bloody battle with the AESC – a battle which history shows determined the economic success of South Australia for half a century. The battle culminated in a Royal Commission of note, which concluded in 1945 that the public interest would be better served by public ownership of the electricity supply and distribution system than by leaving the decisions to the directors of a private company. The stakes were high and the fallout immense as acquiring legislation was drafted. The Bill failed its first reading and the embattled establishment lashed out at the Playford plan. Opposition Leader Cudmore labelled the Premier a Bolshevik. Divisions ran deep as Playford continued his case for nationalisation, which finally culminated after the Legislative Council passed the Bill eight votes to seven. Chifley asked if the South Australian Premier had taken leave of his senses, explaining that sort of money was not available. The question remaining following this brief history of electricity is whether today’s Premier and Treasurer are willing or able to take such decisive and bold steps as those taken by Playford. As was the case in 1999, it would appear from the experience and hardship of the past decades that the argument against private ownership of utilities is now a closed case. The author acknowledges Stewart Cockburn’s book, Playford – Benevolent Despot, from which much of this article’s history is derived. Republished from Adelaide Independent News agency Indaily, if the publication has any issue with republishing please contact rosettamoon.